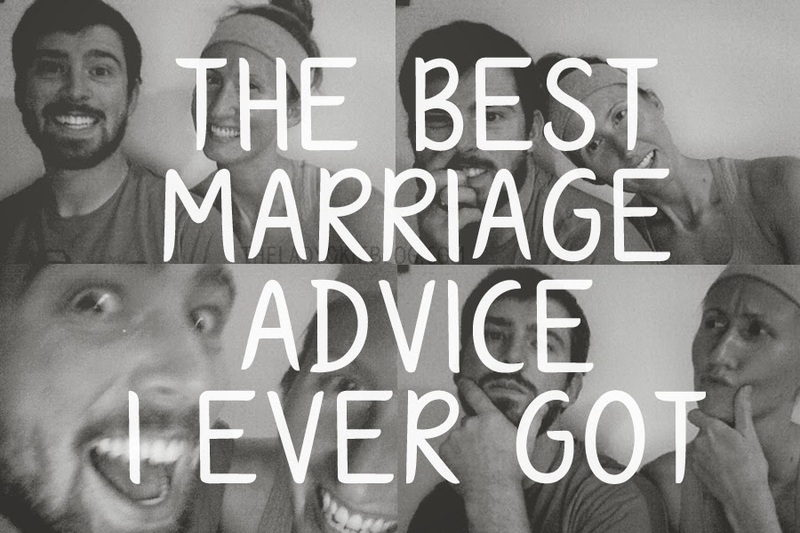 When you get married, you get a lot of advice. Some of it will apply to your marriage, some of it won't, but it's all given by well-meaning family and friends who (hopefully) just want to you to be happy in your marriage. I don't usually remember exactly who said what, but in this case, I know for a fact that it was my mother who gave me the best piece of marriage advice I've heard yet. Of course it would be my mother. The woman is brilliant. You're on the same team. You see, when I'm frustrated with Jordan, it's because I feel wronged. I feel like he's not doing things my way or he's disrupting my world in some way. Sometimes I react and strike back, hoping to make him feel pain just like I do. But what my mom was trying to tell me is that I need to stop acting like Jordan is trying to work against me. Yes, maybe he annoyed me, but it wasn't intentional, and I need to realize that Jordan and I are on the same team. We're not out to get each other. We're not trying to sabotage what the other person is doing. If either one of us is irresponsible with money or if we're mean to each other or if we talk bad about each other to our friends, we both lose. If one of us needs help and the other doesn't do anything about it, our team loses. So being spiteful to Jordan doesn't just hurt him; it hurts me too. I've heard spouses referred to as soul mates, best friends, and partners, among other things, but it's most helpful for me to think about Jordan as my teammate. We encourage each other when we've struck out. We protect each other when someone trash talks them. We run out to home plate screaming with joy when the other has hit a home run. Because we're a team, him and me. As we go through life, we'll have our ups and downs, but no matter what, win or lose, we'll do it together. Linking up with Kelsea and Kristin for Total Truth Thursday. Great advice! Being annoyed at someone does make it easy to feel like they're doing it on purpose, or just choosing to be ignorant of what you're thinking. Its good to be reminded how making the choice to work together can help move things past the problem! Love this! Great advice. People are eager to give me wedding tidbits right now and I'm eager to hear them all with just over four months until my big day! Relationships in general are all about working together and being on the same team. My MIL recently referred to hubby and I as a team and it was the biggest compliment. We're on the same side and that's what matters. Loved this... so true and it really changes everything when you think about it that way! So glad that we have this link up to share our hearts and learn from fellow bloggers! Glad I found you on Hey Kelsea Rae. Great advice. In the heat of the moment it is east to lose that focus but always great to bring it around and remember you are working together. Yes, yes, yes!! This is such a great reminder. Lamar and I try to remember this when we get in arguments and it usually really helps the situation. Love this! That's great advice. I said those words to Michael just last night! ha. We were taking our frustrations out on each other and I finally stopped and said, "We're on the same team". And I think it kind of hit both of us that we're supposed to be working together, and we aren't each other's enemy. It's hard to remember during a disagreement. Your mom is a wise woman :) I'm so glad you linked up! That is definitely some of the best advice! Along similar lines, I always try really hard to keep a practice of, "don't beat the dead horse." If my husband does something that he's clearly already disappointed in himself for, it does neither of us any good for me to say I told you so. And I try to extend that same courtesy to all of the people I care about, too! Because I would want the same courtesy extended to me. We remind each other of this often in our marriage. :) It's hard work, but it's so wonderful knowing someone is on your team. Our first year of marriage Tyler constantly reminded me that he was on my team. "Hey, remember, we're on the same team" It totally helped. Amen mama! Those moms and their good advice. And good listening skills to boot! That is such an important thing to remember and sometimes so easy to forget. Moms are so brilliant! Too bad it took me 20 years to figure that out! I love that too! I always try to think of us as a team. It encompasses so much that is needed to make a marriage work and and when I think of it that way it really puts things in perspective. Great advice! Something I really needed to remember about this time last night... It's so easy to get in a me vs you mode, but it can't be like that. Together is always better. Your momma was a wise lady! Excellent advice. Yes! If more remembered this, perhaps there would be less separation. I got advice from my hubby's aunt when we first go married: "Always have your own, separate, bank account." Well, I never did that, we are still married, and she is divorced twice. That is good advice for any relationship, I think! I am always telling my students that I work with one-on-one (my "projects" I call them), "I'm on your side! I am not the enemy." I like that advice a lot. It's a great thing to think about even when you're in a serious relationship, too. I like the word "teammate" better than soulmate anyway. I love this advice. When we got engaged everyone came out with advice. Some good and some not soo good. Good advice, indeed! A united front also makes child rearing 50 million times easier. that is SUCH good advice - and something I really need to remember when I accuse Jon of having his proprieties all screwed up. (Yeah, I'm not proud of it, but that's my stock nasty insult.) He wants our team to win just as much as I do even if he sees a different way of getting there! That is great advice. Moms are great for that aren't they. When asked to impart her great wisdom, mine simply said "Fight naked." A little silly, but I think both mom-isms will be helpful. Plus, doesn't it feel so great to know that you have a teammate for life?! Such a good way to think about things! This is awesome! So much truth here! I love the idea of how you are on the same team as your spouse! Christopher and I learned the hard way in our early dating years that talking to other people about our problems was not productive. It was just us complaining about the issues in our relationship and never learning to work through them. We had a huge falling out with that group of friends and we realized that we had been terrible about protecting each other. So from that day on, we learned not to speak negatively about each other to anyone. Instead when we have an issue we go to each other and talk about it. It wasn't easy to learn at first, but it has been so good for us.